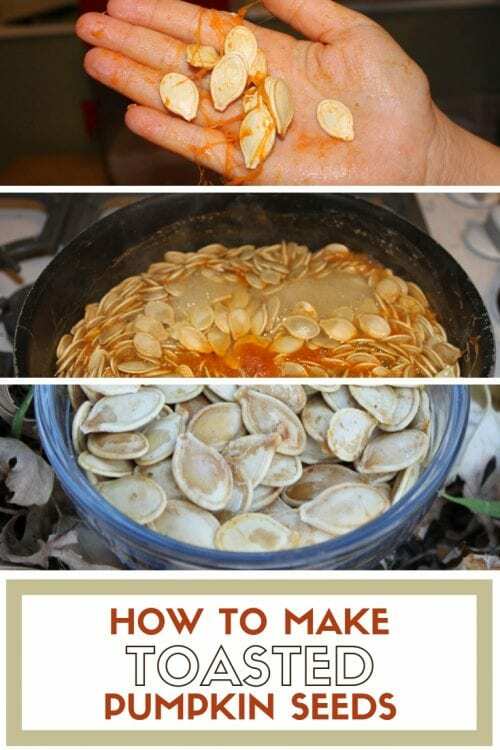 How to Make Toasted Pumpkin Seeds. Don’t throw the “guts” away! Turn those seeds into a delicious and salty snack. An Easy DIY Recipe Tutorial Idea. My favorite part of carving pumpkins is eating the toasted pumpkin seeds! Pumpkin seeds are so yummy and this is the only time of year I eat them! Every year search the Pinterest for a recipe because I can never remember what I made the year before. The recipe I found this year looked easy enough so I thought I would give it a try. This recipe came from Simply Recipes. The fun part, at least for the kids, is gutting the pumpkins. 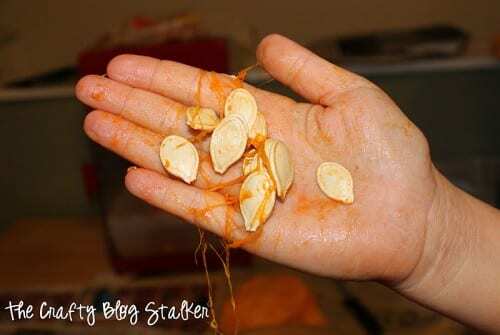 I am a girly girl and hate being sticky or slimy and to me the inside of a pumpkin is disgusting! So I just supervise. When all the “guts” are removed, put everything into a strainer in the sink. With water running go through the seeds until all those yucky, orange stringy things are gone. It really doesn’t take very long. Maybe 5 minutes. I have never boiled my seeds before I had always just coated them and put them straight into the oven. I must say I like boiling. It didn’t take that much longer and the salty flavor was more infused then just on the outside. Never seen boiling pumpkin seeds before? This is what they look like. It’s kind of cool to watch! After they have boiled for 10 minutes, take them out and strain the water. Pour the seeds onto a cookie sheet that has been lightly coated with olive oil. The recipe says to bake for 10-20 minutes but mine baked for about 30 minutes. I did it in 10-minute increments and stirred the seeds on the sheet between each 10-minutes. MMMMM! They came out nice and crunchy and not at all chewy. Now that I have blogged this recipe, I will definitely be able to find it next year! 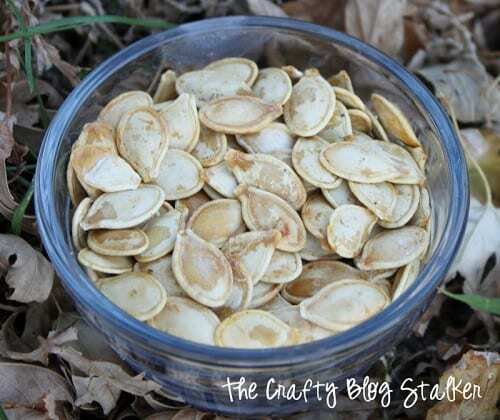 SAVE HOW TO MAKE TOASTED PUMPKIN SEEDS TO YOUR FAVORITE PINTEREST BOARD! These look soo delicious.. I just love anything pumpkin! Thank you for mentioning how to eat them. I lived in England most of my life and they are not eaten there. Now I am in Canada they seem popular, but I couldn’t find any mention of how to eat them, I wondered if you had to split them like sunflower seeds. I have some boiling on the stove top as I type and tonight I will have my first ever roasted pumpkin seeds! I am so happy you shared this @ Show & Share, thank you! Whenever I make pumpkin seeds they always end up chewy, so I am so excited to try your method!! Yum! I love pumpkin seeds! These look so tasty! Have a great week! 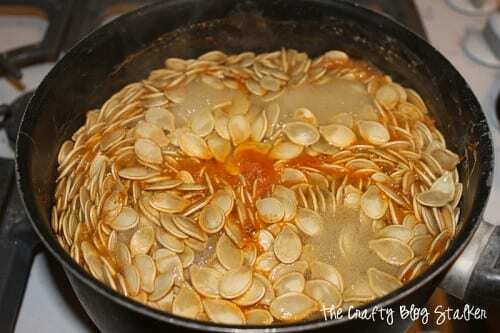 I love pumpkin seeds and have just tried winging a recipe, so I’m glad to have found a real one that is sure to come out yummy! Thank you for letting my feature this on my blog! Thanks for sharing this on Tutorial Thursdays, I will definitely be trying these out as my last attempt at roasting pumpkin seeds was a failure!